A digital revolution is upon us, according to IDC. And while that doesn’t sound like much of an original forecast from a research firm, it noted 2016 will herald a number of developments that IT leaders will have to deal with. Innovations long-talked about but starting to become a reality this year include self-driving vehicles, social retail marketing and the 3D printing of human organs, said Mike Rosen, vice-president of research for IDC’s executive program in a recent webcast, Leveraging 2016 FutureScape CIO Agenda Predictions: Research-Based Planning in Critical Domains. It was 10 years ago that fledgling and ultimately disruptive Netflix launched a contest to improve its movie recommendation engine; the company awarded the prize in 2009 to an algorithm that improved upon its own by 10 per cent, but Netflix would never implement the procedure because it could not economically scale. Rosen said CIOs need to shift gears and deliver change both rapidly and consistently — any sustainable digital transformation requires a strategic architecture. IDC predicts that by 2017, 60 per cent of digital transformation initiatives will not be able to scale due to lack of strategic architecture. With every change within IT comes the opportunity to increase or decrease cost and complexity, said Rosen, but digital transformation projects that are begun with an understanding of the enterprise negatively impact cost, complexity, integration, inconsistency and security. 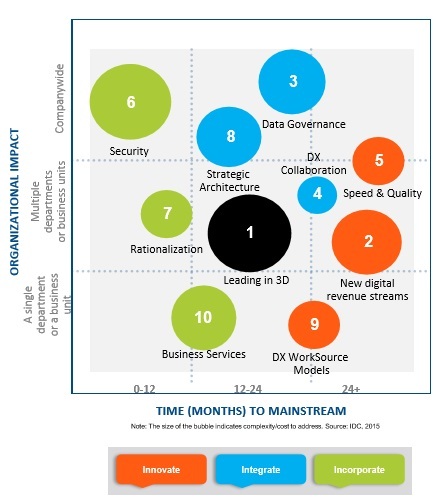 IDC offers a number of predictions in its webcast but, emphasizing a number for shifts for CIOs who lead their organizations away from new siloes to flexibility, speed, and consistent experience by providing a easy-to-understand framework for “common where possible, different where competitive that enables business agility and innovation and supports improved decision making. IDC also sees high-performing CIOs will continuously revisit the optimum mix of crowdsourcing, outsourcing, and in-house delivery options and leverage them accordingly, and that by 2018, 80 per cent of development organizations supporting digital transformation will incorporate collective genius and crowdsourcing into their projects as a regular practice.